Our oceanside condo is 23ft. from the ocean and is located on the 2nd floor and offers spectacular sunsets. Watch the surfers and the dolphins from your lanai. A Short walk to town and over 20 restaurants. Our one-of-a-kind immaculate upgraded condo has every thing you'll need for a great vacation. It has all the comforts of home. Floor-to-ceiling windows look out to the West to see the beautiful Kona sunsets and the ever changing Kailua bay. * Only 8 miles from Keahole airport. * One bedroom, one bathroom w/comfort height toilet. * Very short walk to town, shopping, and restaurants. * Oceanfront: pool, spa, and barbecue area. * Free covered parking and elevator access. * Cal King size bed with a hide a bed in the living room. * Air Conditioning, Flat screen cable TV, CD. * Ocean access is steps away. * Washer and Dryer are inside your condo. * This is a non smoking condo. * Free WiFi and long distance phone calls to Canada & the mainland. * Honl's Beach park is next door. 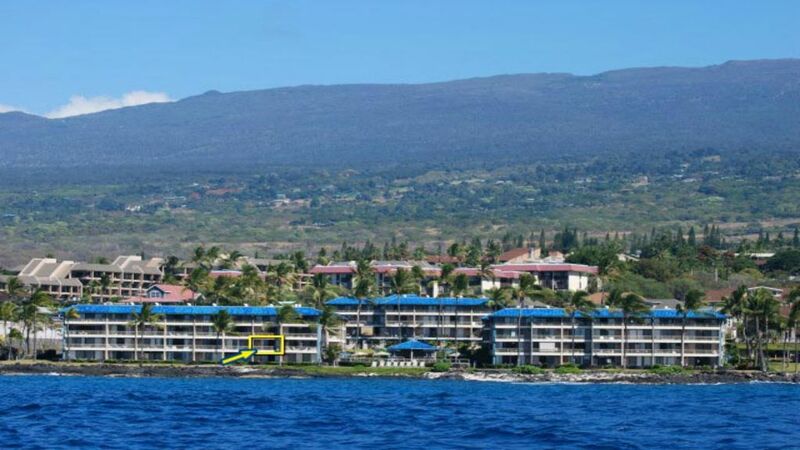 Keywords: Oceanfront rental, Condominium, Vacation, Rental, Hawaiian vacation, Hawaii Condos, Vacation rental, Golf, Surfing, SUP, Shopping, Diving, Oceanside, Kona, Hawaii, ocean access rental, condo in Hawaii. Having a great day on the water! Location! Our condo is on the Ocean with wonderful sunsets. And, within a seven minute walk to the village of Kailua-Kona. We have our condo set up as our home away from home. We love relaxing to the sound of the waves breaking in front of our condo. We have a short easy walk to Kailua village. A 7 minute walk to Kailua-Kona Village. You are so close to the ocean, it seems like you are on the ocean. As close as you can get to the ocean. Deep sea fishing. Also, try Stand up paddle boarding. Take in a luau.